If you follow my personal blog, you know one of our cars is a British Racing Green MINI Cooper S. If you follow this blog, you know the Spider-Kitten once tried to fall off the second floor through a gap in the stair railing. Those two items came together this past week. 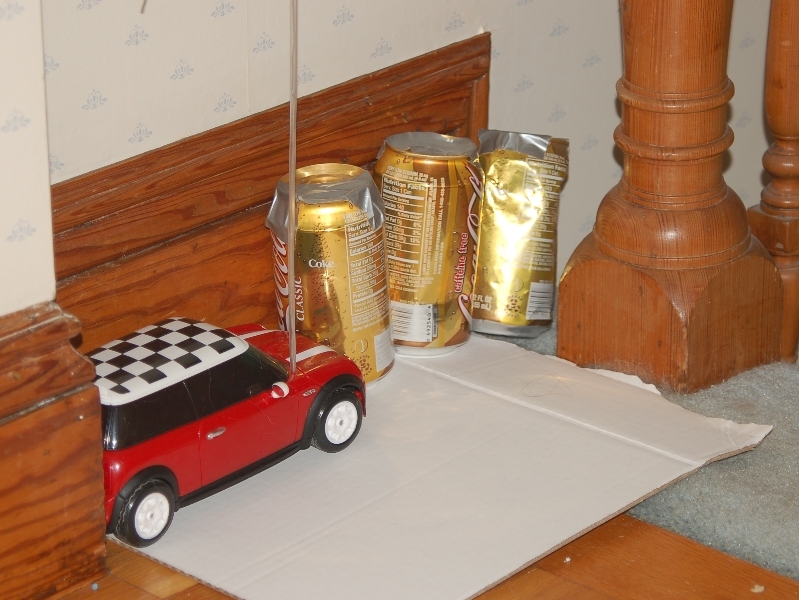 Our secret weapon is a new radio controlled MINI Cooper S positioned to drop shake cans on the first floor by pushing them off the ledge. It met my requirements nicely: Cheap, locally obtained, too wide to fall through the gap itself, and can be controlled from the bedroom so the cats can't hear me preparing to launch. And of course, it's so cute Katherine doesn't object. We have not actually used it yet to quiet a cat, but if even if we never do, we still have a car to match our die cast Miata model built in the same scale. The MINI is cheaper plastic, but the Miata is a static display (not self-propelled).